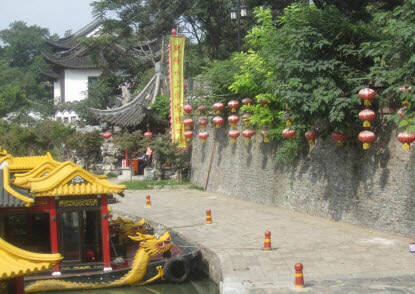 Cities of 15 million coined ‘small’, hours of driving across new terrain both rural and urban, cuisine never before experienced, impressive manufacturing processes, and seeing first hand new product innovations are just a few of the impressions our VP of Sales, Brian Dieringer, returned with from China. The Trip to the Shipping Container Motherland, as we referred to in our September newsletter and part 1 of this series, was both eye opening and inspirational. The port of Shanghai was the home base of Brian’s visit which also included trips inland through rural terrain past cities of 12 million or more to visit a few of the China based shipping container manufacturers. The port of Shanghai is situated at the middle of the 18,000KM long Chinese coastline, where the Yangtze River, know as “the Golden Waterway”, flows into the sea. It is the leading port in the T-Shaped waterway network composed by the Yangtze River and the coastline, and is also China’s largest comprehensive port and one of the country’s most important gateways for foreign trade. The port of Shanghai holds the honor as the #1 World Container Port in a field of 50 ranked. Shanghai, China, reports a volume of shipment in 2011 at 31.74 million TEUs. A TEU refers to a Twenty Foot Equivalent unit. This unit is used to measure the use of a 20-foot shipping container whose dimensions are 20 foot long, 8 foot wide and 8 foot high. These dimensions are a world wide standard and designated by the Intermodal Organization for Standardization (ISO). Falcon Containers' trip to China allowed us to experience first hand the vastness of the Chinese country and the volume of production that takes place there. This key player in global trade, the country of China and it’s port of Shanghai, is home to the leaders of manufacturing of ISO shipping containers. 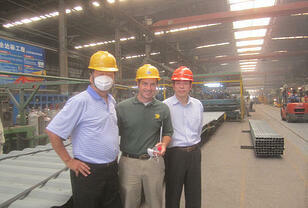 The steel structures are a key component in all global trade. This was compelling to see and experience. These trips made our company reflect on Falcon’s spot on the map of travel these shipping containers take. At Falcon Containers, those containers landing in US ports at possibly the end of their vital life cycle are repurposed in the US and put into a second life. Whether it be to store precious cargo off-site, house remote workers safely and temporarily or provide a secure climate controlled work environment, our product line takes the possible end of the life cycle of these shipping containers and turns them into productive structures to simplify our clients operations. It was a fabulous trip for our company and we would like to extend a thank you to the individuals that hosted our factory visits, exciting sightseeing trips and fabulous meals. Xie Xie and Thank you! They Have Arrived - Now What? With a voyage that possibly spans thousands of sea miles, rail miles and land miles, a standard ISO shipping container that will be repurposed arrives in a ‘condition’ that we at Falcon Containers term as ‘Type”. The inventory of repurposed shipping containers could be viewed as a travel log of sorts. Each of these containers has it’s own story of travels, locations, cargo type and length of years in service. We have come upon messages written inside by individuals in various languages. Discovery of scratches and dents that are left after someone’s heirlooms are transported across the country tell a story. Even the iPhone that sits in your hand came to the US via one of these containers. While in China, we were able to see first hand the fabrication process that takes place with the containers that arrive in the US as One Trip Containers. The names says it all….one trip across the ocean from Asia with a cargo load. This is a close to a new container as possible. These containers are manufactured and painted in a controlled environment and have been built with a process to withstand ten plus years of wear and tear. Our clients come to us for solutions to simplify their businesses and the use of a repurposed shipping container brings another journey to these structures’ travel logs. Whether a shipping container modification process is used to construct a Falcon Office Box or Falcon Living Box, or just simply for use as dry secure storage at your businesses’ location, the conex box ‘type’ is available for your choice. The condition of the box can vary and at Falcon we focus on a set of functional features to ‘grade’ for our Type classification. The classification of wind and water tight is an important feature and is a guarantee with our Type 1 and 2 boxes. The condition of the exterior in regards to aesthetics is also graded as some clients are concerned about visibility and placement of these containers near business operations while others are not concerned beyond the secure dry storage requirement. In our most recent blog post, we expanded on the Type 1- 4 designations. A summary of our types with corresponding uses follows. Type 1- this container includes the ‘one tripper’ described above and is ideal for the client looking for a pristine container where aesthetics are important due to the visibility of the structure. This container is ideal for the container modification process. Type 2- this shipping container is wind and water tight and may have some blemishes or slight cosmetic issues. This structure offers good working doors and latches with gaskets and latchgear in great shape. Type 3 – this conex box has seen some travels and while not aesthetically pristine this structure may be the perfect choice for the client who does not have the need for cosmetic perfection. Type 4- this structure has extreme wear and tear and often is acquired by clients for use of the materials that are a part of the structure. For your business purpose, one of the conex boxes in our inventory might have just the right travel log and length in it’s history. For more information on our repurposed shipping containers please visit our website and our Container Sales area.